These plastic sleeves are nailed to a wooden bulkhead to provide a place for a load transfer dowel. Greenstreak. Diamond-shaped load plates transfer loads across a construction joint without creating restraint in any direction. Note the activated contraction joint. PNA Construction Technologies. Aggregate interlock is created within an activated contraction joint. 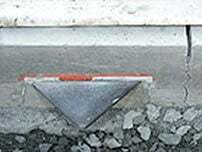 The broken edge below the joint is irregular enough that the aggregate that projects locks into the other side. If the joints are spaced close together (or the concrete doesn't shrink much), so that they don't open too much, aggregate interlock can be effective. For heavier loads, though, use a mechanical shear-transfer method. 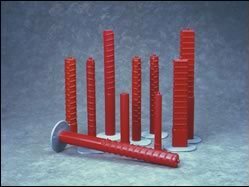 There are a variety of mechanical load-transfer (or shear-transfer) devices, including dowels (both square and round), diamond-shaped load plates, and keyways. Keyways were mentioned in the section on construction joints. They are not normally recommended, although can be effective in construction joints that remain tight. Dowels must be aligned properly to be effective. Dowels must be perpendicular to the joint both vertically and horizontally. Misaligned dowels can lead to joint deterioration. Dowels must be smooth, with no sharp edges that can catch in the concrete. Rebars do not make good dowels. One half of the dowel, within the concrete on one side or the other, must not be bonded to the concrete to allow the joint to open as the concrete shrinks. Debonding agents or grease are commonly used. Don't apply the grease too thickly. The best way to keep dowels properly aligned in a construction joint is to drill holes through the bulkheads, or use a proprietary bulkhead form that aligns the dowels. For saw-cut contraction joints, the best method is to use dowel baskets, then come back to cut the joint above the dowels. Diamond-shaped load-plates for construction joints are a newer, and very effective, method that allow the slab to shrink in two directions, eliminating all restraint. Sizes and spacing for round. square, and rectangular dowels and for diamond-shaped load plates are provided in ACI 302.1R-04, Guide for Concrete Floor and Slab Construction or ACI 360R-06, Design of Slabs on Ground.